Education without borders (Uddannelse Uden Grænser (UUG)) is the biggest education fair in Denmark, and it is held every year in January/February in five different regions. Most higher education degree programmes in Denmark are presented at the fair. In addition, the vocational education programmes, upper secondary schools, folk high schools, and also private and public companies and foreign universities are broadly represented at the fair. Find more information about Education without borders. You have the opportunity to get an intimate experience of student life at Aarhus University by participating in a three-day study experience programme that takes place each year in week 43. Study environment, study rhythm, social activities and studying in itself is difficult to describe in writing, but has to be experienced in real life. During the study experience, you will gain an insight into how student life works by attending university classes – e.g. lectures and practical and theoretical classroom teaching. U-days is a special open house fair in Aarhus organised by all of the institutions of higher education in Aarhus. In the course of three days (Thursday, Friday, Saturday), all these institutions invite you to come and get counselling and information about the study programmes. Find more information about U-days in Aarhus (information only in Danish). Information meeting in Herning: Every year, our campus in Herning hosts an annual information meeting where you can hear about the degree programmes at Department of Business Development and Technology in Herning, meet students, professors and student counsellors, participate in guided tours around campus and much more. If you need inspiration, information or advice about your supplementary options, then the information meeting about supplementary subjects will most likely be relevant for you. The event is an ideal opportunity to visit some of the supplementary options offered at Aarhus BSS as well as at the other faculties at Aarhus University. Find more information about the Information meeting about supplementary subjects (Link only in Danish). At the information meeting in Aarhus, you can learn more about all Master's programmes offered at Aarhus University, meet students, lecturers and student counsellors. Find more information about the information meeting in Aarhus. At the Master's information meeting in Aarhus, you can hear more about the Master's programme in Corporate Communication. Additionally, you can also meet students, lecturers and student counsellors. 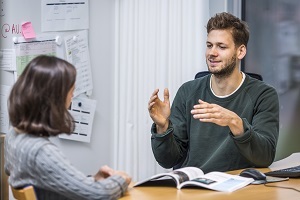 At the Master's information meeting in Aarhus, you can hear more about the Master's programme in Economics and Business Administration & Economics and Management. Additionally, you can also meet students, lecturers and student counsellors. Information meeting in Herning: Every year, our campus in Herning hosts an annual information meeting where you can hear about the degree programmes at the Department of Business Development and Technology in Herning, meet students, lecturers and student counsellors, participate in guided tours around campus and much more. Student counselling is a service offered to both future and current students. You can contact us if you have any questions concerning your choice of study programme.